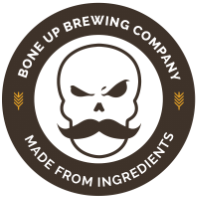 Stats: Stone Valley - Bone Up Brewing Co.
Color: Um, amber? I mean, it's right there in the style name, so it better be amber (or at least amberish). Best Occasion to Drink: While you're spooning the radiator in vain attempt to remind yourself that it is actually possible to feel too warm. Brewers' Notes: Even though we're sloggin' through the Dark Days of Winter, we like to have something that brings a little bit o' brightness and sunshine into our days (but only a bit. Not, like, "I went to Jamaica for New Year's, check out my tan" kinds of sunshine). Anyway, nothing warms our cold black hearts quite like The Gift of Friendship, so we gathered up a buncha ingredients from some beer friends (specifically Stone Path Malt, Valley Malt, and - of course - Four Star Farms hops) and made this delightful lil' amber ale! It's a tasty treat that can't be beat, so come drink some and get jolly with us!